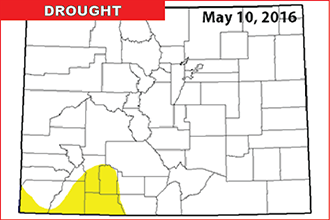 While southwest Colorado continues with areas considered abnormally dry, additional precipitation in the southeast has completely alleviated drought and abnormally dry conditions across the area. abnormally day - one step below moderate drought. Earlier in the year, essentially all of the southeast quarter of the state was considered at least abnormally dry, and many areas, including Kiowa County, had entered moderate to severe drought. Several recent state-wide rounds of rain and snow dramatically improved what had become rapidly expanding drought over the past few months. As of this week's report, only Montezuma, La Plata, Archuleta, Conejos, Rio Grande, Mineral, Hinsdale and San Juan Counties are impacted by abnormally dry conditions, and none of the state is showing drought. One year ago, 29 percent of the state was in moderate drought and an additional 20 percent was experiencing severe drought.